Google has released the latest Android Platform version report which sees Android Nougat finally break through the 1% install base level. The report is based on devices that visited the Play Store for a 7-day period ending February 6, 2017. While it is not the ultimate report of which versions of Android are in use, it is nevertheless a good resource to get a picture of what is out in the wild. For Nougat, across versions 7.0 and 7.1, the devices coming to the Play Store topped out at 1.2%, nearly double that of the .7% from the January report. This number should continue to increase as new devices hit the market as well as updates to Nougat from HTC, Sony, Moto and others that have been happening over the course of the past few weeks. It’s still a low number but it is heading in the right direction. Android Marshmallow was the only version of those in the report besides Nougat to see an increase in usage. Marshmallow jumped 1.1% to 30.7% of the total while Lollipop, KitKat and Jelly Bean all saw drops. Lollipop fell .5% to 32.9 while KitKat saw a .7% decrease and Jelly Bean was down .3%. 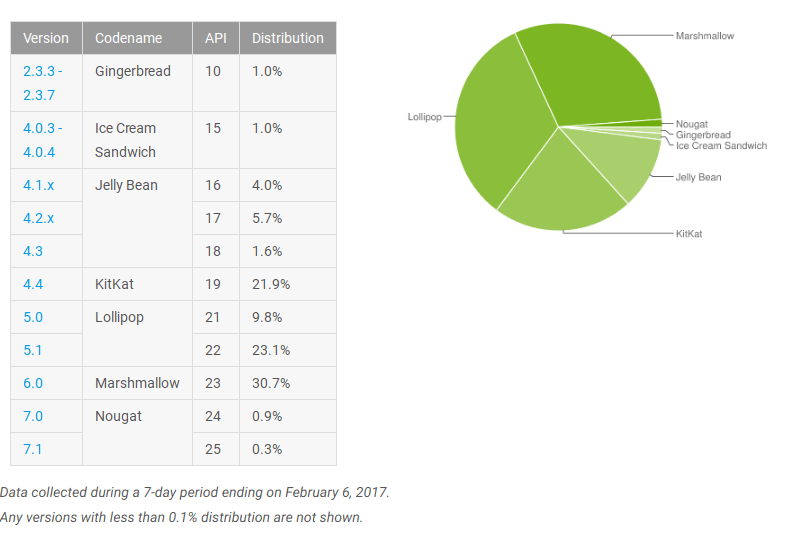 Android Gingerbread and Ice Cream Sandwich just made the report with a 1% total each. 1.35% in those coming to the site from those devices. It accounted for 28.74% of all Android traffic to the site. Android Marshmallow however had the biggest gain over last month, increasing 4.76% to 47.03% of all Android traffic. Lollipop saw a 1% increase too and KitKat was up .65%. Jelly Bean did drop by .02% to 1.61%.